The Trump administration’s plan to withdraw American troops from Syria could take several months to implement, US officials told ABC NewsFriday, stressing that an exact time frame has not yet been agreed. Shortly after US President Donald Trump’s surprise announcement that the forces would pullout, officials said the plan could be implemented in as little as 30 days. However, according to ABC, the pace of withdrawal could actually be far slower, appearing to confirm the president’s statement during a surprise trip to Iraq on Wednesday when he said there would be a “strong, deliberate and orderly withdrawal” of US forces from Syria, where they have been helping battle Islamic State jihadists. Officials told ABC that the withdrawal plan will be carefully executed to ensure the safety of all US personnel, as well as the removal of all military hardware from the country. Officials said US and coalition aircraft will carry out airstrikes and provide air support for US troops during the withdrawal, but it was not made clear whether the strikes would continue after the pullout. The president this week defended his decision to pull the troops out, saying that it is because of US military gains that he can withdraw 2,000 forces from Syria. “I made it clear from the beginning that our mission in Syria was to strip ISIS of its military strongholds,” Trump told troops clad in fatigues at al-Asad Airbase west of Baghdad. “We are spread out all over the world. We are in countries most people haven’t even heard about. Frankly, it’s ridiculous,” he added. He said that Turkish President Recep Tayyip Erdogan has agreed to take out “any remnants” of IS left in Syria. The US presence in Syria was not meant to be “open-ended,” he said, adding that other wealthy nations should pay for rebuilding Syria. “The nations of the region must step up and take more responsibility for their future,” said Trump. Trump’s trip to Iraq came a week after he stunned his national security advisers by announcing the US troop withdrawal from Syria. Defense Secretary Jim Mattis abruptly resigned following the announcement, and Trump’s decision rattled allies around the world, including in Iraq. Trump told reporters he had overruled generals asking to extend the Syria deployment, where about 2,000 US forces, joined by other foreign troops, assist local fighters battling the Islamic State jihadist group. “You can’t have any more time. You’ve had enough time,” he said he told the top brass. For Israel, the pullout leaves it without a staunch ally in the fight against Iran in Syria and potentially opens the door for the Islamic Republic to create a so-called “land bridge” from Iran, through Iraq and Syria, into Lebanon and the Mediterranean Sea. 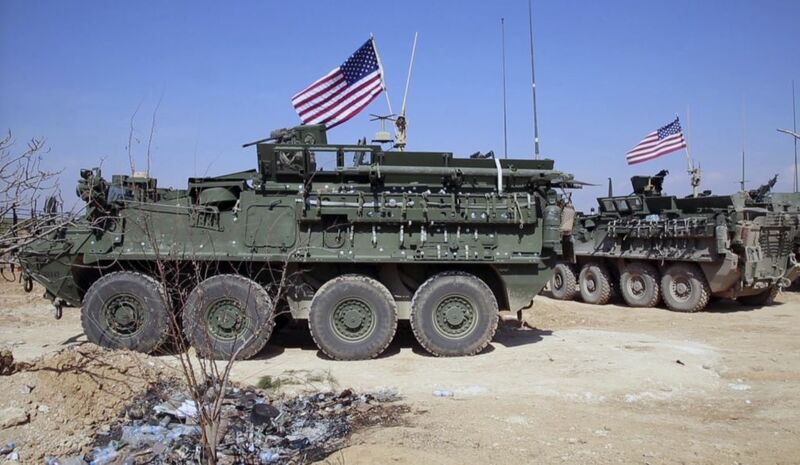 Until now, American troops have been stationed in northeastern Syria, along the Iraqi border, blocking such a corridor, through which Iran could more easily distribute advanced weapons and technology throughout the region, especially to its Lebanese client the Hezbollah terrorist army. Prime Minister Benjamin Netanyahu vowed that Israel would step up its fight against Iran’s military presence in Syria, amid concerns that the US military’s pullout from the war-torn country would limit the Jewish state’s ability to operate there. Israel has repeatedly vowed to prevent Iran establishing a permanent presence in Syria and Lebanon and has carried out hundreds of airstrikes in recent years against Iran-backed forces and attempts to smuggle advanced weapons to Hezbollah. Israel allegedly carried out a series of airstrikes in Syria on Tuesday evening, with the IDF announcing it had deployed air defenses against a missile fired from Syria as Damascus attempted to repel the alleged strikes. Israel’s Channel 10 news reported that Netanyahu tried in vain to persuade Trump to change his mind, and that there was tremendous “disappointment” in Jerusalem over the pullout, which is regarded as a victory for Russia, Iran and Hezbollah. The TV report described the US move as “a slap in the face” for Israel, noting that the US presence in Syria was “the only bargaining chip” in Israel’s efforts to persuade Russia to prevent Iran deepening its entrenchment in Syria. This entry was posted on December 28, 2018 at 6:58 PM and is filed under Uncategorized. You can subscribe via RSS 2.0 feed to this post's comments. You can skip to the end and leave a response. Pinging is currently not allowed.